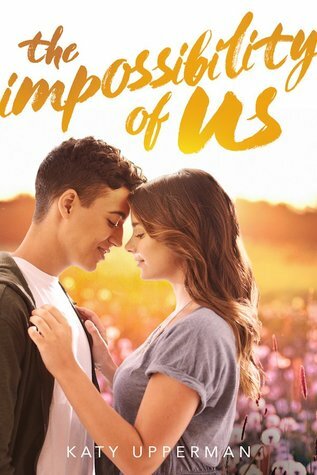 I am so excited to have Katy Upperman on the blog today sharing her playlist inspired by her latest novel, The Impossibility of Us! I adored reading Katy’s debut, Kissing Max Holden, last year (read my review) and I absolutely cannot wait to read her sophomore novel! So without further ado, here’s Katy! Okay, I admit it – I’m one of those boring writers who likes to draft, revise, and edit in complete silence. Music is just… distracting. But when I’m not working? I love an angsty torch song, a sappy country ballade, or a poppy refrain. I find inspiration in music all the time, and I create playlists for all of the manuscripts I work on – sometimes even before I’ve opened a Word document. Today, I’d love to share a few of the songs that are on the playlist I made for The Impossibility of Us. I’m including the lyrics that most relate to the book, as well as how the song inspired me. Corresponding Lyric– I walked out, I said, “I’m setting you free.” But the monsters turned out to be just trees. When the sun came up, you were looking at me. Why I Love It– Taylor Swift finds her way onto all of my bookish playlists. There’s something very honest and raw about her lyrics and, for the most part they feel very YA. Out of the Woods works so well with The Impossibility of Us because Elise and Mati’s story is all about making it through the tough stuff. Corresponding Lyric– Is there anybody in there? Just nod if you can hear me. Why I Love It– I’m into this song more for its tone and weirdness and the emotion it evokes than its actual lyrics. Though, I find the idea of being “comfortably numb” and kind of… unheard? unseen?… relatable, particularly when I think back to my teenage years. Corresponding Lyric– Cards on the table, we’re both showing hearts. Risking it all, though it’s hard. Why I Love It– In a lot of romances, the pair stands in its own way. That’s not the case with The Impossibility of Us. Elise and Mati are super compatible. They respect each other and care about each other so much. Their conflict arises from external challenges they have little control over but are willing to risk everything to conquer. All of Me says something similar: If we’re all in, we’ll beat the odds. Corresponding Lyric– I miss the pull of your heart. I taste the sparks on your tongue. Why I Love It– When I listen to this song I think of break-ups and make-ups, and all the passion and heartache that comes with a complex relationship. I love how evocative and beautifully written it is, and I think it’s really cool that despite the song’s intense lyrics, it feels peppy and fun. Corresponding Lyric– Today is the greatest day I’ve never known. Can’t wait for tomorrow; I might not have that long. Why I Love It– In The Impossibility of Us, Elise and Mati’s relationship has a built-in expiration date; he’s in the U.S. on a quickly expiring Visa, and she can’t follow him back to Afghanistan. They share a lot of “greatest” days, knowing they may not have the chance again. I love this song as a sort of life motto, honestly, but it’s a pretty perfect complement to The Impossibility of Us, too. Corresponding Lyric– Honey just put your sweet lips on my lips. We should just kiss like real people do. Why I Love It– It’s a kissing song. ’Nuff said. I’d love to know: How does music play into your creative life? Katy Upperman is a graduate of Washington State University, a former elementary school teacher, and an insatiable reader. When not writing for young adults, Katy can be found whipping up batches of chocolate chip cookies, or exploring the country with her husband and daughter. KISSING MAX HOLDEN is her debut novel; her sophomore novel, THE IMPOSSIBILITY OF US, will be available summer, 2018. I love this idea for an author interview! Music has always been something that I listen to while I craft. A lot of times I end up doodling or painting the lyrics that I love! Thanks! I loved reading Katy’s answers too and seeing a peak into her writing! I love that a Smashing Pumpkins song made the list, and the reason for Today being on the list is making me a little misty. That’s expiration date thing sort of broke me when I read this book, because I loved these two together. I’m so glad you enjoyed seeing this peak into The Impossibility of Us and know the songs!